I hope everyone who celebrated had a good Thanksgiving. It was rather crowded here in our little house with my sister’s family here for the first time in years, as well as my Cousin’s family and my mom. We needed an extra table in addition to the extra table leaves. And I see a need for floor pillows for the living room before next time. Yay! More sewing projects! We made lefse, which is traditional in our family for holidays – pretty much the only carryover from the Scandinavian ancestors. I also learned that 1) brussel sprouts come on enormous, thick stalks, and 2) I don’t like them. In addition to hosting Thanksgiving over this holiday weekend, there was crafting. I did a lot of cutting. Square after square after square. Some of it was for an upcoming mystery QAL that starts in January. The cutting list requires more than 600 squares ranging from 2 1/2 to 4 1/2, with lots of 5/8 and 7/8 variations inbetween. It is the new Scrapitude QAL, in case anyone else wants to join in. Looks like a pretty small pile for 600+ squares! doesn’t it!? I went through my black and dark blue scraps, added some gold and yellows, and very pale neutrals for the rest. I’m still debating the background color – white or medium gray probably. While I worked on the fabric squares, my cousin spent an equal number of hours playing with my sister’s cricut machine, cutting out all manner of shapes. I snuck in a few snowflakes. 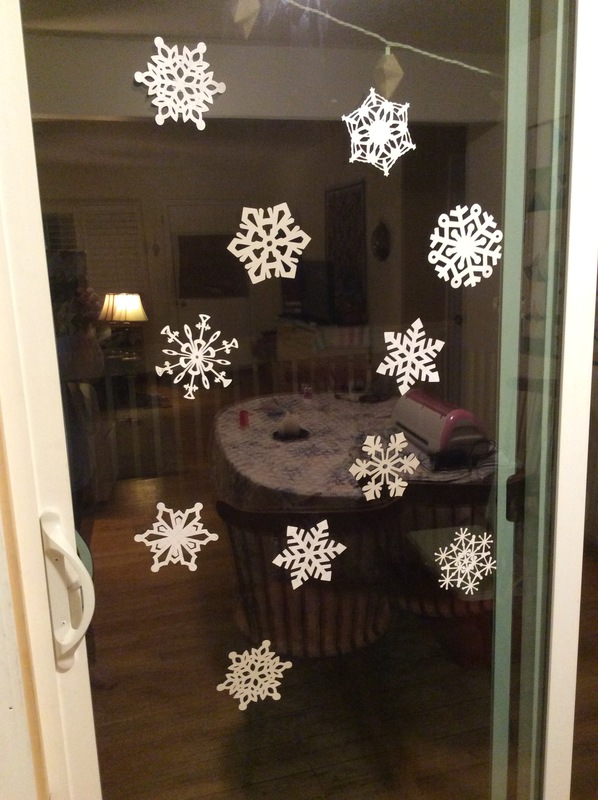 (The boys and I hope that putting them up in the window will attract real snow, though the strong El Niño makes that an unlikely event this winter.) That machine is so much fun! 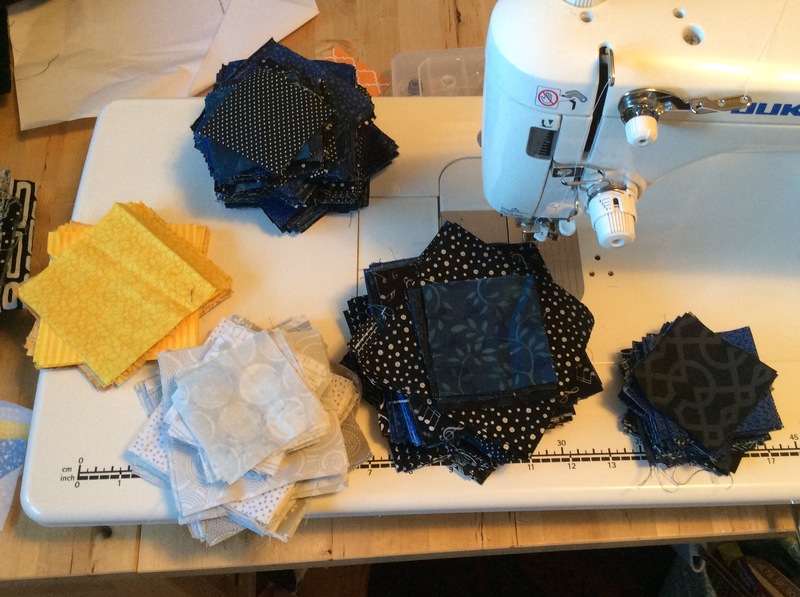 I cut a bunch more 2 1/2″ squares for my scrap bin as well, and then yesterday I got ichy for the sewing machine after all that family togetherness so I started making wonky stars with them. I’m throwing in as many different fabrics as I can, so it is going to be very colorful. Hopefully, the white stars will give eyes a place to rest from the bright mish-mash. Making them is addicting – I was up this morning before I even got dressed, making more. Posted on November 29, 2015 November 29, 2015 Categories Family, QuiltsTags Scrapitude, Scrappy, Snowflake, Squares, Stars, ThanksgivingLeave a comment on So many squares!